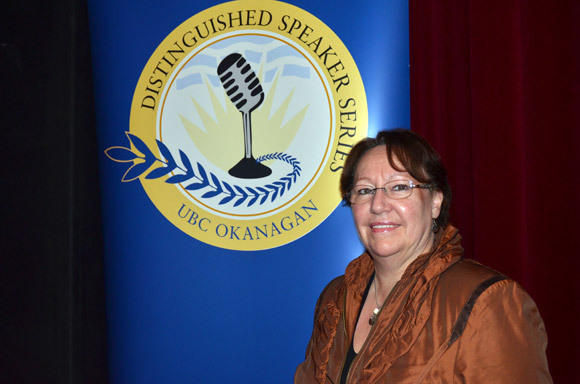 World-renowned arctic activist Sheila Watt-Cloutier spoke to a Vernon audience Wednesday night about the realities of the Arctic, where Inuit today face profound challenges to their environment, their economy, their health and their cultural well-being. Her presentation at the Vernon and District Performing Arts Centre was the second in this season's UBC Distinguished Speaker Series. "We in the Arctic have been subject to the most dramatic environmental effects of globalization," says Watt-Cloutier, who was nominated for the Nobel Peace Prize in 2007 for her advocacy work in global climate change. "Arctic communities have benefited the least from industry yet are carrying the brunt of industry." Watt-Cloutier notes that as a result of globalization, northern Indigenous Peoples and Inuit have experienced rapid change to their traditional way of life over a very short period – and the change has come with dramatic consequences. "It gives new meaning to the term going from ice age to space age," she says. "The change has happened within the span of my lifetime, and it is often the root of the challenges and dependencies that we now face in the Arctic. "Historical traumas that have happened in our history have eroded the Indigenous sense of identity, our self-worth and lessened our ability to think and act for ourselves, and these in turn have translated into monumental health and social challenges for our people. These challenges are all too often misunderstood as an inability to adapt to a modern world – and that couldn't be further from the truth – in fact, adaptation is our strength." Watt-Cloutier believes the solution to climate change and the preservation of a healthy arctic and global community can be achieved by understanding the world's connectivity, and by refocusing the international conversation on the environment from economy to humanity. "I'm confident the world will come together if we can understand how truly connected we are," says Watt-Cloutier. "We're learning more and more just how expensive it is becoming to be losing the cooling system – the air conditioner if you will – for the planet. And eventually inaction will cost more than action. Soon the excuse 'it's too expensive to change' will no longer be accepted. It will be too expensive not to." Northern Indigenous peoples will be key to this movement, says Watt-Cloutier, as their knowledge and wisdom of the land and its history will have a large role to play in the solution. "Northern Indigenous peoples – Inuit and First Nations alike – are the ground truthers of the global environment of change, and for decades now, we've been the one to experience these changes first hand. For us, these are not just environmental issues – they are first and foremost about the health of individuals, families, communities, environment and wildlife. "Every level of the governance system in the north has to be mobilized to ensure Indigenous knowledge and wisdom is the foundation of all sustainable economic endeavours." Based in Nunavut, Watt-Cloutier is an Officer of the Order of Canada. She is also the recipient of many prestigious awards, including the Aboriginal Achievement Award, the UN Champion of the Earth Award, and the prestigious Norwegian Sophie Prize. Under her leadership, she and 62 fellow Inuit from Canada and Alaska launched the world's first international legal action on climate change, with a petition to the Inter-American Commission on Human Rights.